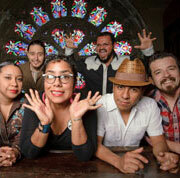 GRAMMY-nominated La Santa Cecilia-fronted by belter La Marisoul-draws inspiration from a hybrid of Latin culture, rock and world music in passionate performances that mesmerize audiences. After an interview moderated by Josh Kun, curator of the PST/GRAMMY Museum exhibition Trouble in Paradise: Music and Los Angeles 1945-75 and director of The Popular Music Project at USC Annenberg's The Norman Lear Center, La Santa Cecilia will take audience questions and perform a selection of songs. During the post-concert reception, Asco icon Patssi Valdez leads a crunch-and-fold workshop inspired by Asco's 1970's-era public appearances as self-made fashionistas in paper gowns and hats. See Valdez's work in Mapping Another L.A.: The Chicano Art Movement, which will be open. Reception includes dessert and a cash bar. Note: This performance is took place at The Fowler Museum at UCLA, located in the heart of UCLA's north campus.